Fishing is a great way to reconnect with friends and family. Children under age 16 don’t need a license to fish, so bring them along for a day of fresh air, sunshine and family fun! An inexpensive rod-and-reel, a colorful, kid-friendly tackle box for toting hooks, sinkers, bobbers, lures, and a pair of pliers is all you need! Plan ahead and let the kids help decide where to go and what to bring. Dress for the weather and don’t forget snacks and drinks, a hat, sunglasses and sunscreen. It’s a good idea to keep the first few trips short and let interest and enthusiasm grow. For most kids, it’s important to make a catch that first time out. You can help by seeking out places that are packed with panfish, like crappies and sunfish. 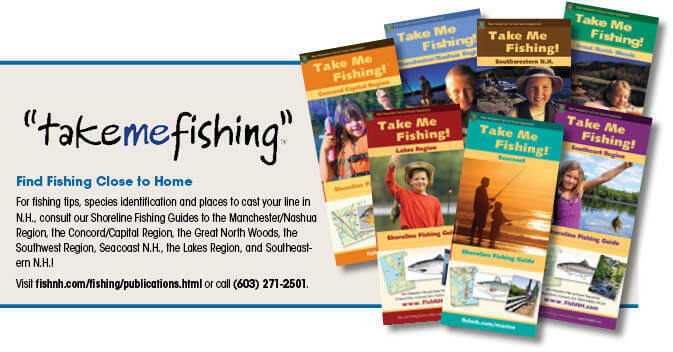 Check our Take Me Fishing Guides for ideas on where to go and what kinds of fish you might catch. Don’t forget the camera — you’ll definitely want to have a picture of that first-fish smile! Being outside in the fresh air and sunshine is the most obvious benefit of learning how to fish, but taking a break from electronic devices is an added bonus! Fishing doesn’t have to be difficult or far from home. The important thing is to go fishing as a family and have fun! Take advantage of New Hampshire’s annual Free Fishing Days on January 19 and June 1, 2019. You can fish any fresh or salt water in N.H. without a license on those days. Applies to both residents and non-residents. All other fishing regulations apply. Note that all anglers participating in fishing tournaments on Free Fishing Days must have a license.